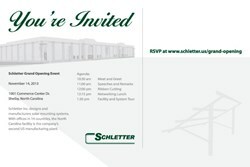 Schletter invites renewable energy stakeholders, partners, and community leaders to celebrate the Grand Opening of the company’s second US manufacturing facility. “The addition of the Shelby, North Carolina manufacturing facility gives Schletter the largest manufacturing capacity for solar mounting systems in North America." Schletter©, a worldwide leader in photovoltaic mounting systems, announces a Grand Opening and Ribbon Cutting Ceremony at the company’s new North American headquarters in Shelby, North Carolina on November 14. The North Carolina facility is currently operational and production of solar mounting systems and custom sheet metal fabrication began this past summer. Expansion of the original structure is complete with 140,000 square feet of highly-automated manufacturing space and administrative offices. In Shelby, the company currently employs a staff of 100 and plans to hire 70 more before the end of the year. In the United States, Schletter employs over 200 individuals while globally the company employs more 1,600. Located in Cleveland County, the Shelby, North Carolina facility is the company’s third North American manufacturing facility opened since starting business in the United States in 2007. The company’s original facility in Tucson, Arizona will continue to supply products to customers in the western United States while the company’s second facility in Ontario, Canada will continue to serve the Canadian market. In addition to the three manufacturing facilities, the company maintains offices in Connecticut and has plans to open a new office in Texas in 2014. The Grand Opening and Ribbon Cutting will take place on November 14, followed by a day of celebration and collaboration for vendors and employees on November 15. The company invites its customers, community leaders, and industry stakeholders to register for the Grand Opening at its website: http://www.schletter.us/grand-opening.html. Schletter (http://www.schletter.us) has designed, developed, and manufactured solar mounting products in the U.S. since 2008, while backed with more than 20-years of solar mounting experience from Schletter GmbH. Since opening its United States facility in Tucson, Arizona Schletter Inc. has manufactured more than 1 GW of installed PV mounting systems. Schletter Inc. offers products for roof mount and ground mount systems for residential, commercial, and utility scale photovoltaic systems. Schletter Inc. is an independent subsidiary of Schletter GmbH, which operates subsidiaries in fifteen countries with more than 1,600 employees worldwide.